Who are the zebras in your world, and how do you sell to them? And can I use Artificial Intelligence to help me in sales? Jeff Koser has the answers. He is the CEO of Selling to Zebras, Inc. and can teach us all about closing deals with your top revenue-producing customers, your Zebras. Karla Nelson: And welcome to the People Catalyst podcast, Jeff Koser. Jeff Koser: Hi Karla Nelson, how have you been? Karla Nelson: Oh my goodness, it’s been a while my friend. Jeff Koser: It has, hasn’t it? Karla Nelson: Yes, we’ve been very, very busy using new technology, which is going to be so fun for us to get into on this. Because as you know, we both were service-based business in the past. Ours, live training, and your … I’ll give you a chance to chat about how Selling to Zebras has innovated over the years. Which is just the hot topic, right? Karla Nelson: It’s really good to have you on the show again, and have you talk about these new changes in IE, or AI and machine learning, adapted to your long time process of Selling to Zebras. Karla Nelson: So, first of all lets go ahead and rewind a little bit, Jeff, and share that story of how you first started. You’re the CEO of Selling to Zebras, and then how … Since technology is such a … specifically AI and machine learning in service-based businesses. Just the journey that you’ve had, your entrepreneurial journey in that, from where you started, and what’s happening now? Jeff Koser: Sounds good. So Selling to Zebras was born out of necessity originally. I joined a software company that was selling ERP, Enterprise Resource Planning. Karla Nelson: Oh my gosh, I haven’t heard that in a while. Jeff Koser: And it’s a very complex thing to sell, because companies use that software to run their entire business, so it’s a very big decision. It’s a very risky decision, and they tend not to buy from companies that they don’t know. And if you’re a foreign company with no customers, which is what we were, coming into the US, that has risk written all over it. Jeff Koser: So we developed the Zebra Process, to identify who would buy from a company like that. Who would get so much value that they would take the risk to buy? And then, how do you extrapolate that into building a business that continues to grow? Because you have to … You can’t just sell to innovators and early adopters, because there aren’t enough of them. [crosstalk 00:02:52]. Karla Nelson: I love it, that’s my language as you know. Jeff Koser: I do know. So we adopted it over time, and we built value based materials. So like a business case around it, into the process, and how do you prove it? How do you gap where they are today versus where you could take them? And it really evolved into a process that helped us build Baan, B-A-A-N, from a small regional software company in the Netherlands, to a global powerhouse in the ERP space. When the group of us left five years later, they were about 850 million in annual revenues, and I left there to start Selling to Zebras. Karla Nelson: And in the Netherlands, that’s a big company? Jeff Koser: It is a big company. It still exists. They’re owned by Infor corporation, and they’re still the lead ERP product for Infor corporation. Karla Nelson: And so what did you do, when you guys left? Jeff Koser: So Selling to Zebras was really, principally a consulting firm. So we taught the methodology, we created the tools, and that evolved into some pretty elaborate Excel-based capabilities. But it was pretty complex, it generated word documents, and PowerPoint materials from that Excel spreadsheet. So you had to become almost like a guru in Microsoft Office to really be good at it. So it became outdated. We started designing cloud-based software, that ran off of a browser so you could run it anywhere, anytime. And it was simpler to use, and it put the entire process into software, that actually created materials for sellers, that helped them sell. So you’re literally using it live, and it’s creating presentation materials that are specific for you. What I’ll tell you [crosstalk 00:04:55]. Karla Nelson: Cloud-based changed everything, because you could access it from anywhere. Jeff Koser: Exactly, so that’s kind of the evolution. And we’re a brand new company, literally. In the last year and a half, we’re a totally different company, because we’ve taken the software, and hopefully we’ll take that to the masses. Karla Nelson: Yeah. That reminds me of a great quote, it’s really simple, it’s three words ‘Innovate or die.’ That’s awesome that you’ve really … I feel like you’ve taken us through the last 20 years of evolution of technology. Because 20 years ago, consulting was how you did it, that’s the best you could do, in understanding all the Office products, and then moving to cloud-based. And now, share with us a little bit about this AI release, that integrates AI and machine learning, to then overlay those seven attributes, that we’ll get into a little bit, of what Zebra is and who you’re looking for. Jeff Koser: So that’s a great lead-in. So a Zebra, for your listeners, is the perfect prospect. And it’s the prospect, that based on seven identifiable characteristics, like you just mentioned. Those seven attributes, make up what’s perfect about them for you. And it’s always unique to each customer. And that gives us unique data, that we can then leverage using AI and machine learning, to go find more of them just like that one. So it goes beyond demographics. Like we were talking about before, just because you sell an electrical distributor, doesn’t mean that the next electrical distributor is a really good Zebra for you. It gets into the culture of the company. It gets into, who is the decision maker? What were the business problems that you solved for them? And unique things like, what amount of value does your value proposition create when you solve those? And that’s the type of data that our system not only creates, but then can leverage, so you can go find more Zebras for the company to pursue. Karla Nelson: Love that. And so, with that said, can you walk us through those seven attributes of what a Zebra is? Which, again, is your perfect, perfect prospect. Jeff Koser: So for instance organization, what type of organizations do you do well? Second is operations, what do they look like operationally? Third is power, and power is the ultimate decision maker. And these are in strategic order. Fourth is funding. Fifth is value. Sixth is technology. And seventh is service. And then you define each one of those succinctly, so that you can go from the lower end of the spectrum, on what doesn’t look so good from an organization perspective, to the upper end, what does look good on each one of the seven. And then we score each one of the seven, very simply from zero to four, and they change colors, each one of the individual scores. And then the total score changes colors. And that’s what gives you predictability on your deal, that shows you where you are with your deal. It shows you when you’ve earned the right to ask for the business, and it predicts with 90% accuracy what [crosstalk 00:08:11]. Karla Nelson: It’s like a relational meter. Jeff Koser: That’s right. But simple. Simple [crosstalk 00:08:17]. Karla Nelson: That’s why I love it so much. Because, here’s the thing … Okay Jeff, you and I both know, the old days of finding your ideal client, and then creating the best value opportunity you can for them, came more from a gut decision, and you … There’s different ways that you could do this. Cold calling, networking, referrals. Those were really the primary three. And now what’s happened is, there is this additive layer, of where … And number one, just so much data. I mean, you could walk into an event, there’s 50 people there. You can get a sense at least, I mean. Before we had like demographics, and cycle graphics. My goodness. It’s so much, for one person to learn that. I think we weighed it a lot more on talent, with the sales aspect, without so much support. Karla Nelson: And one of my friends, Matthew Pollard, just wrote a book. It’s about selling when you’re an introvert. It’s called ‘Introvert’s Edge.’ And it’s really unique, because you talk about, this late and early adopters where, previously it was the early adopters that were the ones that were always in the sales position. But he talks about, “Hey you put these processes and systems together. Man, those late adopters a lot of the times eat those early adopters.” One’s just because, they created the system, and they’re fine with that, step-by-step process. Where early adopters tend to go after shiny objects, a bit more. And so, it’s so interesting to look at how sales have shifted so much. However, this sales .. or the person you’re selling, the prospect, must enjoy this process a lot more, because there’s so much data coming into their day-and-day life. So what is your experience with that. And I know this is a kind of a new release, so could be a loaded question. But with those prospects, when the sales person is notified, “Hey, guess what? Now it’s time you’ve got, you’ve come to an f-, you have permission kind of, right? Permission space, to ask this question and move forward.” How does the person that … the purchaser feel about that? Karla Nelson: I love that. I love what you said, “If they don’t want a … They want a buying cycle without going through selling cycle.” Because at the end of the day, we all have challenges we’re trying to overcome in our businesses. And so, “I don’t want to go through the selling cycle.” That’s fantastic. Well, and that’s very true. That’s why a lot of times, the sales … or the buying cycle takes so long, because the selling cycle’s like killing everybody. It’s almost like … One of my good BC friends always says, “Startups don’t fail for lack of funding, they fail from indigestion.” I’m like, that is so good, because everybody gets so tired, it’s almost like … One of my partners Allen Fahden and I always say. Everybody knows that meeting, where you have 37 ideas on the table. You’ve fought for two hours about what you should do. And then everybody picks the mediocre one when they leave, just because they’re tired. And that’s not innovation. Jeff Koser: … I’m writing down your quote just now, because I’m going to steal that. I love that. Karla Nelson: You’ve got it. You’ve got my permission there, Jeff. You mentioned about the data then, and the experience. Tell me about this, really rich data. And then how that data or smart data, you could probably call it, because you’re correlating so many different things. Then creates the deep messaging. Number one, you’re wowing that customer. That’s what I just love. I love the tada factor. So, how does that rich data then create that messaging for the sales professional to then give to the potential client? Jeff Koser: It starts with Zebras, who in essence, in a nutshell, they need what you’re selling. You’ve identified them really clearly, and you can even show them that at the software. You can even have a conversation about, “Here’s why I’m here. I only call when companies they really need me. This is why I think you’re one of them. Do you see it? Do you agree?” So that starts that collaborative agreement on moving forward. Then you’ve prepared a value proposition for them. Not arrogantly, it’s preliminary. You don’t believe it’s completely right, but it’s based on some pretty good data that our system serves up for you. And then you also have the experience from your existing customers. We call that ‘voice of the customer.’ And that services work that our partners do, to gather that kind of information, and then put it into the system, so that you can prepare that preliminary value proposition, which is grounded in the past success you’ve had with customers that are very similar to that prospect that you’re talking to. So that gives you a depth of data, that most other systems don’t have. Or if that exists out there, it’s usually in many different systems. So we kind of put it all together. And by doing that, AI has more to work with. Now, we’re not a big guy, like some of the biggest guys. So we don’t have the volume of data that others have, but we have the quality of data, that’s required to serve up excellent answers and results from [inaudible 00:16:08]. Karla Nelson: Yeah. Interesting, you say about not being the biggest guy. I would have almost ventured to say that’s a better thing this days. Because, they’re trying to innovate, I mean, seriously what’s coming, you can’t just put your head in the sand. However, if you’re this big, large company, and this is the way we’ve always done it, and this is the way we’ve done it for at least the last five years, maybe the last 10 years. When you’re integrating new technologies, and I like what you said there, Jeff. A lot times, you have to go to different places, literally just to client. Maybe a week and a half ago, we were training in Vegas, and we had their innovation teams running. Three out of four teams, their issues, that they saw within the company, because they brought people from all around the company, were all technology problems. Karla Nelson: … that’s just. I just, it makes me tired just thinking about it. Because, I’m a relational person. Now, I know you need technology, and then you can work as a team to be able to get your team to adopt it, but I love the fact that you’re saying it’s an integrated, one technology, because you still have to learn it. However, that’s a big issue facing large corporations today, is that, they’ve just kind of been building on, instead of … They don’t have the ability to start from scratch, or at least start a few iterations back. So that they can create one stop shop. Jeff Koser: That’s why I love sales people. You couldn’t ask sales people. First of all, they wouldn’t adopt that technology, because it wouldn’t help them sell, so like, you could beat them, and they wouldn’t adopt it. Karla Nelson: I love it. Half the time, that’s exactly what we have to do, by the way. We have to give little, tiny, bite-sized pieces. Because of course, we work with a lot of technology companies that want … They’ll spend millions of dollars on software, they can’t even get their people to use it. So then they’re frustrated, but that’s a management strategy, most of the time. Most of the sales software is made for managers, its not made for sales people. Jeff Koser: Exactly. And I always say that sales people have functional ADD. They focus on what’s important, and they know what’s important, and they will do the rest. And you’re right, most sales tools are created for management. They’re not created for the seller to actually help themselves. Karla Nelson: And I like this too, because it’s created for both. It’s created for the sales professional, and it’s created for the clients. And that is the biggest thing. So, we always say, you get your team in the right place, at the right time, doing the right thing, internally first. But what’s so cool about that, is you guys have done that through your software, and enabled your team to be the best at, and do the best part of the work that they can do. And then, look how that impacts the client. A lot of times, people jump over the team, or they jump over their product, and they just want to say, “Oh. We’ve got to find the early adopters, we’ve got to sell to the early adopters.” I mean, that’s really cool and cohesive, what you guys have created there, Jeff. Jeff Koser: Well, thank you. I love what you say too, I mean, I love your Movers, Shakers [inaudible 00:20:04]. 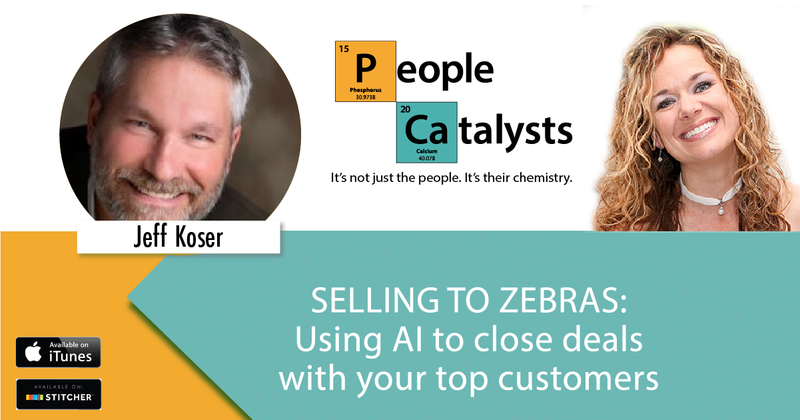 Karla Nelson: … super cool, and for all of our listeners, you can go check out sellingtozebras.com, and again, you can always contact us directly at the People Catalysts podcast, if we can make any introductions. Jeff, thanks again for being on our show. Jeff Koser: Thank you Karla, always a pleasure.